Toast the bread slices and butter on one side each. Brush with mustard and a tablespoon of mayonnaise. 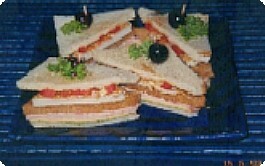 Place lettuce or cabbage leaves over a white toast and cover with a slice of cheese and ham each. Cover with a brown toast and cover with tomato slices. Cut the omellete into half and place over the tomato, (or a fried egg, if preferred ). Cover with the white toast, buttered side down and secure together with tooth-picks. Cut diagonally into half and serve with tomato sauce and mustard on the side. Make the other sandwich in the same way.